Janet Van Dyne is a super hero who uses pym particles to give her similar powers as Ant-Man. She is a longtime member and founder of the Avengers and former wife of the original Ant-Man, Hank Pym. Janet is credited with coming up with the name the, "Avengers". Hope Van Dyne will take over the mantle the Wasp in the film Ant-Man and Wasp. Hope Van Dyne is played by actress Evangeline Lilly. Here are the most awesome Ant-Man and the Wasp products we could find on Amazon using our Amazon Affiliate Connections. Links below go directly to Amazon. Janet Van Dyne is a wealthy debutant living luxuriously off the fortune of her father, the renowned scientist Vernon van Dyne. When an alien kills her father she contacts her friend Hank Pym to help her get justice for her father. Hank reveals his identity as Ant-Man to Janet. He then sets her up to undergo a biological process using his famous pym particles. This process allows Janet to not only shrink to the size of an insect but to also grow wings. The two insect size super heroes battle and defeat the alien that killed her father. Hank and Janet become crime fighting partners using the guises of Ant-Man and Wasp. As their crime fighting career goes on the two begin developing strong feelings for one another. The two partners along with the heroes Hulk, Thor and Iron Man form the super hero team the Avengers. Janet coined the name the Avengers as the name of the Super Team. Janet and Hank are also present when they find the frozen body of Captain America and revive the WW2 hero. While on the Avengers super team Janet is known for using her skill as a fashion designer to develop new costumes. She also often makes comments about the other male members to try to make Hank jealous. Her primary reason for fighting crime at this time is to try to gain the attention of Hank. After battling a huge assortment of bad guys, both Janet and Hank decide to hang up their crime fighting identities for a time. Hank pursues science and Janet her fashion career. Janet succeeds in creating a successful fashion line. The two are pulled back into the super hero world when Attuma kidnaps Janet and it is up Hank to save her. The two rejoin the Avengers. Hank grows mentally unstable over the guilt of creating the robotic menace, Ultron. However, Janet continues to have feelings for him. After being exposed to various gases in a lab experiment Hank experiences a schizophrenic, inhibitions reducing, psychic break with himself. He feels that he is a new person and has actually killed the old Hank Pym. He takes on the name of Yellow Jacket and kidnaps Janet and proposes marriage to her. Janet realizes that Hank is not really Hank but she also is somewhat flattered and enjoys Hank without his inhibitions. Eventually, Hank is snapped out of his funk and returns to normal. However, Janet accepts the proposal for marriage and Hank does not retract it. The marriage of the two is initially happy. However, Hank continues to emotionally degrade into a deep depressive state. This eventually leads Hank to become verbally and later physically abusive toward Janet. The abuse comes to an apex when Hank becomes overly aggressive during an Avengers mission. Captain America wants to hold a trial to kick Hank out of the Avengers. Hank devises a scheme to create a robot with a hidden weakness to attack the Avengers. He reasons that once he exploits the weakness in front of the rest of the Avengers he will be seen as a hero again and welcomed back. Janet is appalled by this plan and tries to stop him however, he very forcefully strikes her. Hank's plan totally implodes and ends with him being kicked out of the Avengers and divorced by Janet. Overtime Janet has evolved into an intellectual and savvy leader of the Avengers. Perhaps due to her own maturity (Or changes in how female characters are written) she is now emotionally deeper and less obsessed with the whims of the men around her. She is shown as being more heroic, and self sacrificing, She has had other relationships with other characters over this time like Hawkeye ,Paladin and Black Knight. As part of the West Coast Avengers Janet found herself once again working with Hank Pym. Hank had returned to mental stability and the two rekindled their love. However, this time Janet turned down Hank's marriage proposal. The two have had continued on and off again relationship but have never remarried. Janet was seemingly killed during the Skrull invasion. She was infected with a serum that forced her to grow huge and become transfused with massive amounts of energy. Thor was able to save Earth by absorbing the energy but Janet was seemingly killed. Later the Avengers learn that she was not killed in the explosion. She was only shrunk and sent to the Microverse where she was later retrieved by the Avengers. She continues to battle evil as an Avenger. Wasp Stings - Can fire energy blasts from wrists using device created by Hank Pym. 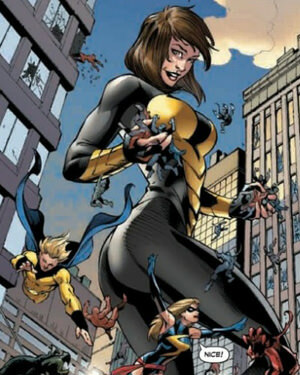 Similar to Hank Pym she has also used Pym Particles to grow in size instead of shrink from time to time. Evangeline Lilly plays Hope Van Dyne who will wear the Wasp suit in the film Ant-Man and Wasp. Here character was introduced in the film Ant-Man but did not have the opportunity to wear the suit in that film. Hope Van Dyne is the daughter of Hank Pym and Janet Van Dyne. An unknown tragedy occured to Janet that caused Hank to stop wearing the suit. Hank kept the suit and showed to Hope at the end of Ant-Man. Evangilne Lilly shared a photo of her ripped arms the day before shooting began on the Ant-Man and Wasp. 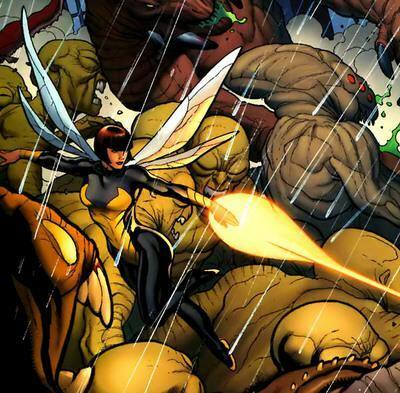 Janet Van Dyne will appear in some fashion in the MCU film Ant-Man. This appearance may be very short and may be used to explain why Hank Pym no longer wears the suit he created.